Home / Racquet Stringing / Why Do Strings Break? When a string breaks, don’t assume that your stringer did something wrong. Here at Racquet Network, our stringers re-string nearly 2000 racquets a year. Less than a dozen racquets a year come back for warranty repairs. This means that 99.994% of the racquets we repair are fine while 0.006% experience premature string breakage. Yet in almost every one of the 0.006% of cases where strings break prematurely, the customer wants to blame us for doing something wrong. They seem to believe that when a string breaks, it has to be somebody’s fault. This is a primer for those folks. The purpose of this article is to share our considerable experience about why strings break and to help players understand why this happens to them. The first thing to understand is that it’s not personal. Nobody is picking on you. It’s not a conspiracy. All strings break eventually. Sometimes they break the first time you use them. Sometimes they last for years. When a racquet is strung, nobody knows how long it is going to last. Your racquet might be in the 99.994% that are fine or it might be in the 0.006% that break prematurely. There is simply no way to know. Even a perfect racquet that is perfectly strung by the world’s best stringer with the world’s best string on the world’s best stringing machine under perfect conditions can break the very first time you hit a ball or a shuttle with it. That’s a coincidence, not a conspiracy. That said, however, there are come common causes for string breakage that we see regularly. Most often, the problem is with the bumper guard or grommets on the racquet itself. If grommets are broken, the graphite from the frame will cut through the string. If you are using a soft multifilament string like Tecnifibre ™ 305 or DNAMX, your string life can be extremely short. The same is true for broken bumper guards. If the string in a racquet is passing over jagged pieces of bumper guard, there is a high likelihood that your strings will break prematurely. This is also true if missing pieces of bumper are exposing the string to wall/floor strikes on the outside of the frame. The second most common cause of string breakage is directly related to how customers use string. In squash, for example, we commonly see problems with men who overpower their string by literally hitting the ball much harder than they need to. In this case, the story goes something like this. A guy buys a squash racquet with thick, low grade factory string. He plays squash for a while and learns to serve overhand and to hit the ball really, really hard. Since the factory strings that were in the racquet when he purchased it are thick and designed for durability rather than playability, the player experiences no consequences for hitting this hard. Eventually, however, the strings in the racquet break and the player brings the racquet in for re-stringing. For whatever reason, he decides to go with a highly playable string like Tecnifibre 305 or DNAMX, which are both playable but not very durable. 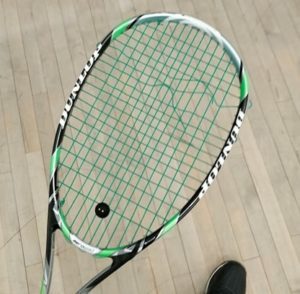 So to nobody’s surprise, he goes out onto the court, pounds his first serve and immediately breaks his expensive new string. Nobody is at fault here. This is simply physics. The strength of the player overpowers the strength of the string. This string is designed for professional squash players who consistently hit the ball in the centre of the stringbed. It is not designed for overhead pounders who hit the ball hard and off centre. This is our second most common cause of string breakage; it is a player/string mismatch. The player and the string are both fine on their own; they are just wrong for each other. This player needs a durable string, not a playable string. Once this is determined, we can advise players in this group to go with a more durable string, like Ashaway ™ Supernick XL Titanium. The important thing to understand here is that nobody can know that the player and the string are wrong for each other until they try to play together. This is a matter of trial and error. Until they try, the error cannot be detected. So the next time your string breaks prematurely, please don’t jump immediately to the conclusion that your stringer did something wrong. Given how we do things in our shop, this is highly unlikely and we suspect this is true for most professional stringers. A more likely explanation is that something else is at fault. Just bring your racquet in for us to look at. We will probably be able to figure out what happened and we will probably be able to help put you back into the 99.994% group.